170 pages | 23 B/W Illus. This provocative book makes a compelling case for reducing the number of workdays in a week to four. Globalization has brought with it fiercer competition and greater worker mobility, and as organizations compete for top talent, they are becoming more open to unconventional worker arrangements, such as remote working and flextime. 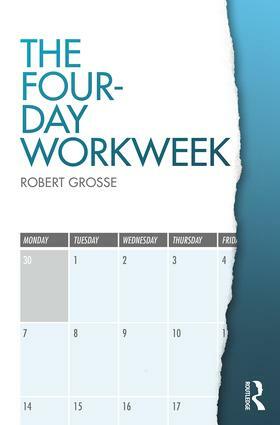 International business expert, Robert Grosse, draws on scholarly research to construct an appealing argument for why the four-day workweek benefits both the organization and the employee. Research has demonstrated that longer work hours harm the individual and don’t amount to a more effective organization, which begs the question: then why do it? The book goes beyond merely arguing that a reduced workweek is a good idea. It delves into why, explores the means for achieving it, and scrutinizes the barriers to getting there. This is a book for forward-thinking executives, leaders, and academics who understand that work–life balance is the secret sauce not only for organizational success, but also for greater productivity and satisfaction in their careers and those of the people they manage. 4. What Will People Do with More Time Free from Work? 7. Logistics – How Can It Be Done? Robert Grosse is Professor of Business Administration at Thunderbird School of Global Management, USA, and a former President of the Academy of International Business. He was the founding Director of Standard Bank Group’s (South Africa) Global Leadership Centre and served as Dean of the School of Business Administration at American University of Sharjah, as well as the Director (Dean) of the EGADE Business School at Monterrey Tec in Mexico.